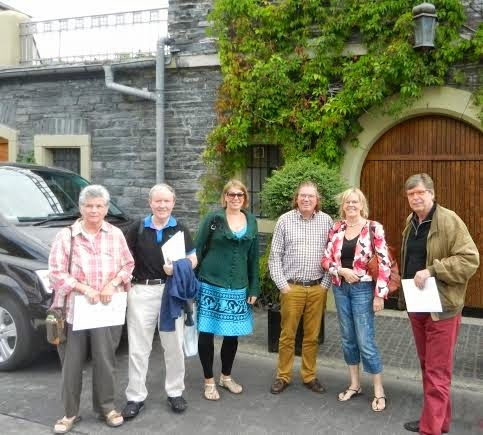 Following the successful Bordeaux Tour 2016 by ombiasy WineTours in September 2016, Annette Schiller has scheduled 4 interesting tastings of German wines for the months of October and November 2016, in Washington DC and in Los Angeles in the USA. 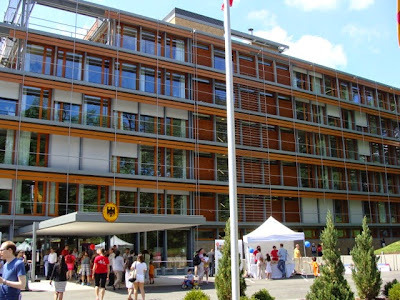 Annette will be the special invitee of the monthly “Deutsch am Mittag” in October at the Goethe Institut. Join us for monthly lunchtime gatherings of those interested in hearing and speaking German. Each month, a special guest speaks on a topic. Participants can bring their lunch and join in the ensuing conversation. Annette will talk about her life in Washington DC since moving to the Washington DC area in 1983. The focus will be on her passion for German wine, in particular her ombiasypr winetours to Germany and France and the her ombiasypr tasting events. We will taste 2 wines. Annette will lead a tasting with 10 German wines. Annette will present 3 red wines, 1 Sekt (sparkling wine) and 5 dry and 1 “halbtrocken” white wines from 9 out of the 13 wine regions in Germany. The tasting also includes 2 Grosses Gewächs (Grand Cru) wines. Germany is increasingly becoming known as a serious red wine producer; Germany is the #3 producer world-wide of Pinot-Noir (= Spätburguder). Germans have always been obsessed with sparkling wines: 1 out of 4 sparklers produced in the world is consumed in Germany; and Germany is home to the second largest sparkling wine producer world-wide. In terms of white wine Germany is known for its Rieslings. Yes, it is the #1 Riesling producer world-wide, but also the #1 Pinot-Blanc (Weissburgunder) and #2 Pinot-Gris (Grauburgunder) producer. Schnaitmann (Württemberg), Kreuzberg (Ahr), Proschwitz (Sachsen), Schönleber (Rheingau), von Oetinger (Rheingau), Immich-Batterieberg (Mosel), Schmitt‘s Kinder (Franken), Lützkendorf (Saale-Unstrut), von Winning (Pfalz), Schloss Neuweier (Baden). In terms of food, Cindy O. Herold, the Chef and Owner of Old Europe Restaurant, will spoil us with a sumptuous Wine Tasting Buffet, composed of a variety of typical German dishes. 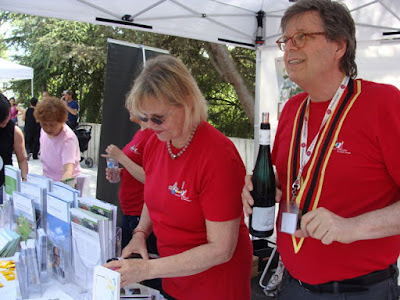 Along the lines of the Washington DC tasting of October 28, Annette will lead a tasting with 6 German wines at Annual Meetings of the American Wine Society. About 400 members from all over the USA are coming to this 3-day event, filled with tastings, seminars and presentations. More than 70 people have already signed up for this event, where Annette will present The New Germany: Red, Sparkling and Dry. Annette will pour the wines from the following winemakers, who graciously sponsored the wines. Special tahnks goes to US importer of German wines Rudi Wiest. We will taste wines from each category of the new classification. The wines are sponsored by Dr. Loosen Bros., the US importer for Dr. Loosen (Mosel), Villa Wolf (Pfalz), Robert Weil (Rheingau), Wittmann (Rheinhessen), Maximin Grünhaus (Mosel) and Fritz Haag (Mosel).